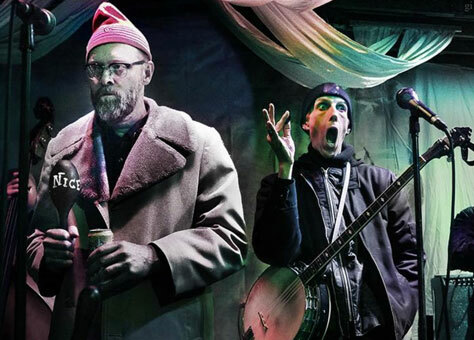 We’re delighted to be welcoming Slim Cessna’s Auto Club back, following their sold out show at the Castle Hotel! Seminal Gothic-Americana ensemble Slim Cessna’s Auto Club are re-releasing their fourth album Cipher. This re-issue is a double vinyl LP in a gatefold sleeve and marks the first of eventually full catalog reissues on the Auto Club’s own label, SCACUNINCORPORATED. Wallace Stenger may have captured the spirit of the west in his 1971 novel Angle of Repose. Jim Thompson surely exposed the lurid underbelly of the Western experience. Cormac McCarthy definitely evoked the conflicted, tortured spirit of small town life on the frontier. William Faulkner and Flannery O’Connor informed all of them with a humor and soulfulness. It is that literary tradition that imbues the harrowing and celebratory sound and riveting stories of Slim Cessna’s Auto Club. Throughout its long and illustrious history, it is largely in that realm of art that the Auto Club reveled and garnered a loyal cult following well beyond the boundaries of The Queen City of the Plains. Originally released in 2008, Cipher is the most cohesive SCAC album but also the most mysterious. Cipher is a deliberate puzzle loaded with coded language. The idea that braces are used to straighten crooked humanity provides a structure, but this code rewards effort to unpack the many messages it contains; many more relevant now than ever. Compared to its predecessors, this set of songs sounds more hopeful and expansive, a quality that was always there but this time out the brighter sides of the songwriting were emphasized. Slim Cessna’s Auto Club was originally formed in 1992 in Denver, Colorado by its namesake after he parted ways with The Denver Gentlemen, that grand progenitor of the peculiar strain of Gothic Americana unique to the Mile High City that also featured Jeffrey-Paul and David Eugene Edwards who’d go on to form 16 Horsepower, the latter then founding Wovenhand. Slim’s longest running collaborators in the Auto Club have been Munly Munly and Lord Dwight Pentacost who’ve contributed both material and affected the ensemble’s stylistic vision. More recently there’ve been greater creative contributions from longtime collaborator Rebecca Vera, drummer Andrew Warner and the inclusion of upright bass player Ian O’Dougherty. In late 2016, the band released a new album after a five-year hiatus The Commandments According to SCAC. The album encompassed both the heady darkness and celebratory intensity with which the group made its name. That charmingly dusky and spare sound breathed with a new colour and delicacy of feeling that perhaps sat in the background in times past. When you get to see the Auto Club live, you’ll see an already mighty band reinvigorated by a new spirit of excitement as well as by the fire that has long burned in its collective belly. Local support comes from Bones Shake, a scuzzed, fuzzed blues three-piece from Manchester. They play everything into the red; violent bottle neck blues riffs, drums kicked, pounded and twatted, and squeals of reverb drenched vocals all combine to help save your soul.